I feature products on this website that I have purchased for myself, or have been passed on to me from friends and other vapers, as well as items that have been gifted to me [sent for free] in exchange for a review. I will always be 100% honest about where a product or item came from, and each review will clearly state if the item has been gifted. The source of the item or product will have absolutely zero bearing on the outcome of my review. With the exception of information that I have personally requested (any questions I may have, for example), the brand or manufacturer will have no review input. To clarify: an item that has been gifted to me will not receive a positive review just because it has been gifted to me. best-ecig.co.uk is a participant in a number of affiliate schemes, including: Amazon EU Associates Programme, Commission Junction, Affiliate Future, Share a Sale, Tradetracker, V2 Cigs Affiliates, Apollo Ecigs affiliates. This list is subject to change at any time and may not be a complete list. Each review will clearly state if it contains affiliate links, both at the top and bottom of the page. If you purchase using these affiliate links, or through any other affiliate links that you see on Facebook, Instagram, Twitter, etc., I will earn a small amount of commission. This is what helps to keep the website going and I can’t thank you enough for your continued support. On occasion, I will share discount codes that will also earn me commission when you use them during purchasing. I will always disclose if this is the case. On social media (where space is limited), I will alert you using the following terms: affiliate, affiliate link. 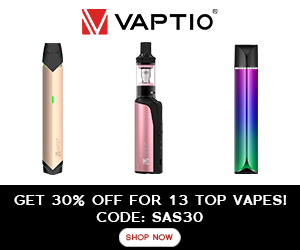 Advertisements that you see on best-ecig.co.uk are affiliate advertisements — one that I have chosen to put there (usually because they look pretty). I do not sell advertising spots on best-ecig.co.uk. Just as with the affiliate links, I will earn a small amount of commission if you purchasing after clicking the advertisements. All the information on this website is published in good faith and for general information purpose only. www.best-ecig.co.uk does not make any warranties about the completeness, reliability and accuracy of this information. Any action you take upon the information you find on this website (https://www.best-ecig.co.uk), is strictly at your own risk. https://www.best-ecig.co.uk will not be liable for any losses and/or damages in connection with the use of our website.